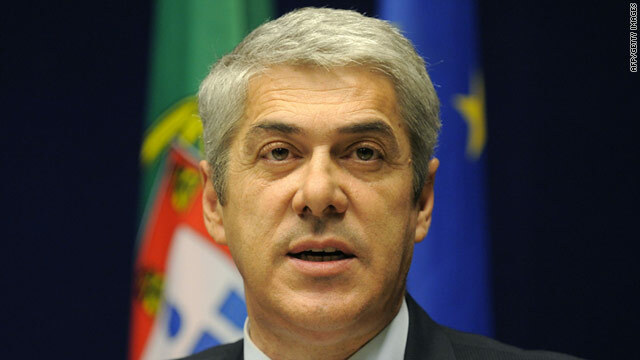 Portugal's Socialist Prime Minister Jose Socrates has said he would resign if parliament votes down his latest economic plan. Madrid, Spain (CNN) -- Portuguese Prime Minister Jose Socrates resigned Wednesday in a televised speech to his debt-ridden nation after parliament rejected his government's austerity plan intended to ease the financial crisis. Opposition parties combined to vote down the plan, which they viewed as hurting Portugal's poor, that had been formulated without broad consensus. Socrates, a Socialist, had threatened to resign if the plan failed. He gave his resignation to the Portuguese president, Anibal Cavaco Silva. The presidential website indicated it was not clear there would be snap elections. Another option, the website indicated, would be for a replacement to be appointed without elections. Socrates said the country is the real loser in the decision. "The obstruction from the opposition today was taken to intolerable levels." Socrates said in his address. "It wasn't just about obstructing the government, it was about obstructing the country." The defeated plan was the latest in a series of austerity measures aimed at resolving Portugal's financial crisis. Where previous plans had increased the country's value added tax to 23 percent and cut salaries of government workers by an average of 5 percent, the latest proposal included budget cuts and a freeze on pensions. Critics said the plan would unfairly hurt low-income residents already struggling under higher taxes. Miguel Macedo, a member of parliament who voted against the proposal, said all of Socrates' plans have failed and the country needs change. He said the government's policies have increased poverty. But Silvia Pereira, a lawmaker who supported the plan, said in debate over the proposal that rejecting the plan could throw the country into turmoil. "The responsibility belongs to whom wanted to add a political crisis to our existent economic crisis," Pereira said. The political turmoil comes on the eve of European Union summit in Brussels that had been expected to focus on the debt crisis in the eurozone but which will now likely include additional attention on Portugal. Portugal's high debt and borrowing costs have prompted repeated speculation in the European Union and in international financial markets that the nation might need a bailout, like Ireland and Greece before it. Socrates' Socialists hold 97 seats in the 230-seat parliament. A spokesman for the main opposition center-right Social Democrats, with 81 seats, said his party was rejecting the government's plan because "we are trying to save the country, not the prime minister." Smaller opposition parties on the left and right also voted against it. The question for many is how Portugal's delicate financial situation, with 10 percent unemployment and tepid economic growth, will fare under a caretaker government. A top Socialist Party official, Jose Lello, told CNN that Socrates will go to Brussels on Thursday for the European Union summit. Socrates' resignation will not have much "impact on the Portuguese economy," financial analyst Filipe Garcia told CNN before the vote. Portugal aims to cut its public sector deficit from 6.8% of gross domestic product last year to 4.6% this year and to just 3% next year, in line with European Union guidelines. But Lello said the opposition had distorted the plan's contents. He said the pension cuts it envisioned would have hit some of the wealthiest Portuguese, not the poorest. "We offered to negotiate to all parties," Lello said. "If we go to elections, let's see." CNN's Joana Godinho contributed to this report.